This month marks the first for Theo Ubique, Chicago’s beloved cabaret theater company, at its shiny new Howard Street space in Evanston. Founded in 1997, the company called the 30-seat Heartland Studios in Rogers Park home until 2004, when it made the switch to the neighborhood’s No Exit Cafe—one of the oldest coffeehouses in the country, doubling its capacity at the time. “We performed at the No Exit Cafe for 13 years and loved the intimacy and acoustics of the space, but its size had become limiting for us. So many of our shows were sold completely to capacity, and we hated to turn away people who wanted to see them. We were interested in moving into a larger space so we could share our work with more people, but not so much larger that we would lose the intimacy our productions are known for,” recounts Ubique Artistic Director Fred Anzevino. In searching for this new space, finding one as flexible as No Exit Cafe was key, as was securing a stage all their own: “Having our own place gives us the time to build our immersive sets that surround the audience and reconfigure the seating and playing areas for each show. It also allows us extend runs more easily—you can’t always do that when another company has booked the space right after you,” says Anzevino. The theater, which gets its unique moniker from the Greek word for god, theo, and ubique, meaning “everywhere” in Latin, had a champion in Evanston alderman Ann Rainey, who first proposed Howard Street. 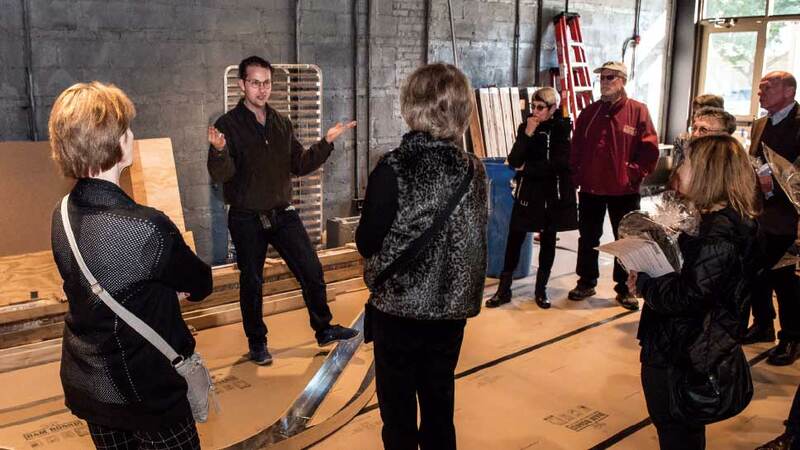 The City of Evanston clearly agreed, investing $1.2 million in a gut rehab of the space to ready it for the theater, including all new plumbing, electric, and an updated HVAC system—along with a bar, catering kitchen, and new restrooms. 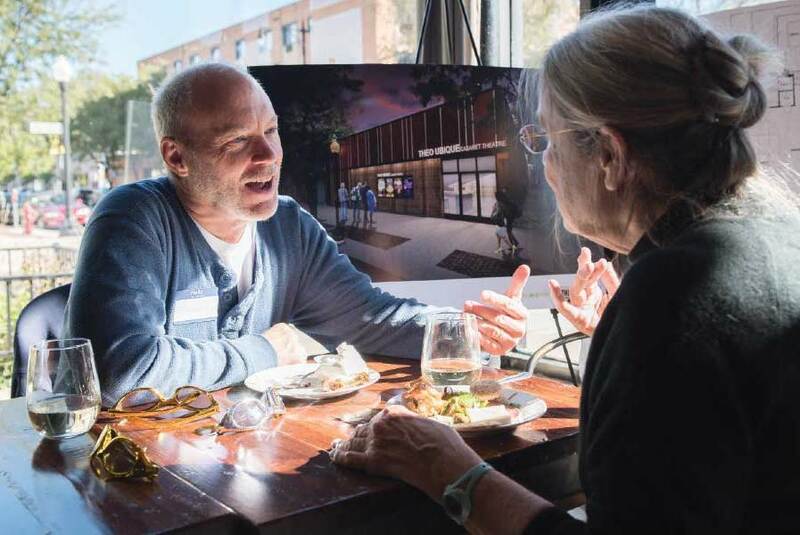 But it was the ability to expand capacity that had the greatest appeal: “The new space will have a seating capacity that is 60 percent larger than what we had at the No Exit Cafe. This will give us so much more opportunity to bring in new patrons that have heard about our shows but haven’t been able to see them. The reputation is there and now with expanded seating capacity, we are in the process of adding to our subscriber base, which is very exciting,” shares Adam Webster, the theater’s general manager. Brand new surroundings won’t be the only draw for audiences. Ubique’s 2018-19 roster is even more enticing. December kicks off with The Full Monty, made famous by the BAFTA and Academy Award-winning 1997 film, running through January 27. “It’s a very funny and heartwarming musical about the way friends and family can support each other through tough times, and it’ll be a great show for families to enjoy together over the holidays,” Avenzino says. Next comes The Bridges of Madison County, opening in March of 2019. Based on James Waller’s novel and the film starring Meryl Streep and Clint Eastwood, Avenzino describes Madison County, the story of an Iowa housewife who has a whirlwind affair, as “a touching romance with beautiful songs by Jason Robert Brown, who wrote the musicals Parade and The Last Five Years”—a production tailor made for Ubique’s uniquely intimate setting. Theo Ubique Cabaret Theatre is located at 721 Howard Street in Evanston, 773-347-1109, theo-u.com.